A few days ago I came across a post on M’s blog about TGRWT. ‘They Go Really Well Together‘ is an event created by Martin and is all about flavour pairs people rarely use. During every edition a single flavour pair is chosen. Other bloggers can participate by creating dishes which contain this pair. TGRWT #2 is hosted by Tara and the flavour pair is banana & parsley. Of course I have tried to create a dish for TGRWT #2. After some thought I figured out I wanted to make a lasagne. 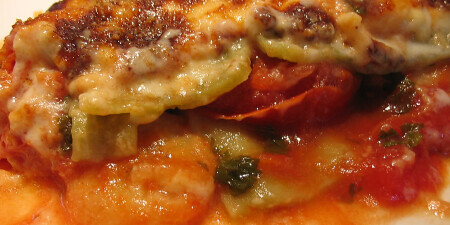 In a recipe from Infonu.nl I saw somebody who used banana & parsley in it’s lasagne. So that convinced me to make a lasagne with banana & parsley. First of all chop up the bananas, tomatoes and parsley. Preheat the oven on 225 degrees. Grease a ovenproof dish with some butter. After that I created a bÃ©chamel sauce with the butter, flower and milk. After adding some Parmigiano Reggiano it turned into a Mornay sauce. First spread a part of the banana mixture out evenly. Cover this with some sheets of the lasagne verdi. Repeat this procedure and finally cover it with the Mornay sauce. Place it in the middle of the preheated oven and cook it for about 30 minutes until the top has turned golden brown as in the picture below. The dish was quite nice. Although I used tomatoes and a mornay sauce I found it suprisingly sweet. The flavour of the bananas dominated in this dish. Only a few times I tasted a bit of parsley. This herb added some contrast to the dish, making it less sweet. Next time I will use less bananas and more curled parsley or maybe flat parsley.